​Barcelona have already secured a deal for Dutch starlet Frenkie de Jong, but it appears that they haven’t finished their business in the Netherlands just yet. Many scoffed at the huge fee ​Everton forked out for ​Richarlison, but the Brazilian has been able to prove his worth for the Toffees this season, bagging 13 Premier League goals. While a summer move is incredibly unlikely, ​Calciomercato are reporting that ​AC Milan are willing to try their luck. The report claims that if Milan are willing to delve deep into their pockets then there’s a small chance they may be able to twist Everton’s arm by offering no less than €75m. ​Fulham’s season was undeniably miserable, but there were a few (very few) players to come away with their reputations relatively unscathed – one of which being Ryan Sessegnon. The youngster is almost certain to be on the move after the Cottager’s inevitable relegation to the Championship was recently confirmed and ​Tottenham are one of the front runners to land his signature. However, according to ​The Express, Spurs will face stiff competition in the shape of European heavyweights ​Juventus. ​Watford have done a remarkable job under Javi Gracia this season, but there is no use in standing still and resting on your laurels when it comes to the transfer market. The Hornets clearly recognise this and, according to ​HLN. they’re paying close attention to Gent midfielder Birger Verstraete. He’s by no means a household name, but earned himself an international cap with Belgium last year and, based on the plethora of talent they’ve been able to produce over the past few years, that’s no mean feat. Reece James is one of about 27,500 ​Chelsea players currently out on loan but, judging by his performances with Wigan this season, there’s actually a (small) chance he’ll have a sustained future with the Blues. Not if ​Manchester United can help it. ​The Daily Mail claim that the Red Devils have been keeping an eye on the 19-year-old all season and could be prepared to make a move for him during the summer transfer window. This entry was posted in News on 23/04/2019 by mirsinho. Chelsea were unable to move up to third in the Premier League as they drew 2-2 with Burnley on Monday night. After Chelsea started the game on the front foot, it was Burnley who took the lead in the eighth minute. The Clarets won a corner as the ball fell to Jeff Hendrick on the edge of the box, who excellently volleyed past Kepa Arrizabalaga to give the hosts a surprise lead. Chelsea drew level four minutes later, as Eden Hazard worked his way through the Burnley defence before pulling it back to N’Golo Kante who fired home. The Blues scored their second goal in two minutes, as Gonzalo Higuain lashed his powerful shot past Tom Heaton. However Burnley got themselves back into the game, as Ashley Barnes poked home from a free kick just 10 minutes later. The ball found its way through to his strike partner Chris Wood, as his glancing header was met by an unmarked Barnes who drew the Clarets level. Chelsea produced another mixed performance, as their defensive performance greatly contrasted their attacking one. While the Blues were excellent going forward creating chances and controlling their game, their defending was very poor with no signs of organisation. While Chelsea attacked well, their lacklustre work at the back cost them. It was frustratingly mediocre, with poor marking and positioning contributing to Burnley’s goals. Chelsea lost two points at the Bridge, as they couldn’t capitalise on their top four rivals’ dropped points. Starting XI: Arrizabalaga (6); Emerson (6), Luiz (5), Christensen (5), Azpilicueta (5); Loftus-Cheek (7*), Jorginho (6), Kante (7); Hazard (6), Higuain (7), Hudson-Odoi (6). Substitutes: Pedro (6), Kovacic (5), Giroud (6). STAR MAN – ​Ruben Loftus-Cheek had an excellent game on Monday night, as he controlled the game alongside Kante as well as working hard in attack. Although he picked up a slight knock in the first half, he carried on and played very well for Chelsea in a very physical affair. ​Burnley earned a hard fought point at Stamford Bridge, as they came away from west London with a result for the second year running. Their opening goal was excellent and although they found themselves behind just six minutes later, they fought hard to get back into the game. It was a resilient display from Sean Dyche’s side, as once they drew level they fought to keep it that way. They stood firm in defence, giving a fine example of a strong back line. Burnley head home with a well deserved point, as they all but secured their Premier League safety. Starting XI: Heaton (6); Taylor (6), Mee (8*), Tarkowski (6), Lowton (6); McNeil (6), Westwood (6), Cork (6), Hendrick (7); Wood (7), Barnes (7). STAR MAN – At the heart of a superb defensive performance, Ben Mee was absolutely outstanding. The Clarets defender won every battle and every tackle, even pulling off a first half goal line clearance. He was outstanding all game long, and played a key role in Burnley’s draw. ​Chelsea face another huge test in their pursuit of a top four finish on Sunday, as they travel to Old Trafford to face Manchester United. The Blues will then travel to Germany in the Europa League, as they meet Bundesliga side Eintracht Frankfurt in the semi-final first leg on 2 May. Burnley are back at Turf Moor next, as they host title chasing Manchester City on Sunday. The Clarets are then back on the road five days later, as they make the trip to Merseyside to play Everton on 3 May. This entry was posted in News on 22/04/2019 by mirsinho. ​Chelsea manager Maurizio Sarri has hinted that Olivier Giroud will return to the bench for Monday’s meeting with Burnley, despite his impressive form in the Europa League. Both Alvaro Morata and Gonzalo Higuain have struggled in front of goal during their respective times at Stamford Bridge, but Sarri has continued to leave Giroud out in the Premier League, even though he is the Europa League’s top scorer this season. ​Speaking ahead of the game, Sarri insisted that ​Giroud has played more than his fair share of games this season, and continues to be dropped for fitness reasons. He said: “Giroud played the match number 39 [in Thursday’s win over Slavia Prague]. Thirty-nine! Not number nine… 39! 39! “Starting games? With 19 or 20 I don’t remember. He is playing because he is very useful for us, like in 70 minutes against Slavia. Very, very useful. In the Premier League this season, Giroud has made just seven starts, as Sarri has preferred Alvaro Morata, Higuain and even Eden Hazard in a central role. He has been forced to settle for minutes in the Europa League, in which Giroud sits atop the scoring charts with ten goals from 11 outings. By contrast, Morata managed just nine goals in 24 appearances before his January loan move to ​Atletico Madrid, and Higuain has found the back of the net three times in 13 matches, all of which came against opposition who have since been relegated from the league. He is out of contract this summer, but the Blues have the option to extend his deal by a further year. Sarri ​confirmed that club officials intend to do so, which would keep Giroud at Stamford Bridge until the summer of 2020. ​Arsenal took a huge step towards their first Women’s Super League title since 2012 on Sunday after a narrow win over Everton took the Gunners four points clear of Manchester City at the top of the table. It means just one more victory from their two remaining games will seal the title. 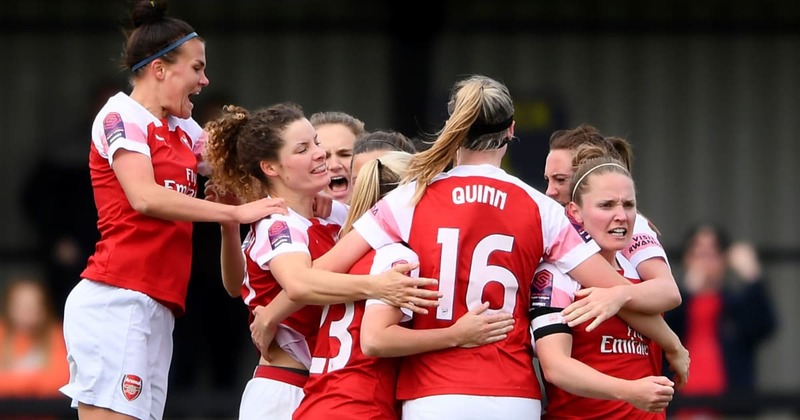 First half goals from Arsenal defender Louise Quinn and record breaking WSL top scorer Vivianne Miedema proved decisive, with second from bottom Everton pulling one back in the second half through Chantelle Boye-Hlorkah. The Gunners have dropped just six points all season and now have enough of a cushion over City, who didn’t play this weekend, that a win against Brighton in their next outing will ensure that the title is wrapped up with a game to spare. That being said, an unexpected slip up against Brighton would turn the final day of the season into an all or nothing title decider when Arsenal host City on 11 May. Based on form, the more likely scenario is that the Gunners beat Brighton and the final day becomes a victory lap. Elsewhere in the WSL, Liverpool ended a run of three consecutive defeats by thrashing Bristol City 5-2. There was a hat-trick for England junior international Rinsola Babajide, while Yana Daniels and Ashley Hodson also got on the score sheet for the Reds. Dutch defender Danique Kerkdijk had equalised in the first half for Bristol, but four further Liverpool goals without reply ensured a late Niamh Fahey own goal was only consolation. Birmingham kept up the pressure on reigning champions Chelsea in the race for third place by winning their game in hand against West Ham. Canadian international Adriana Leon had given the Hammers a first half lead, but goalkeeper Anna Moorhouse was then sent off shortly before the interval for handling the ball outside of the penalty area. Birmingham’s Hayley Ladd immediately capitalised by converting the resutling free-kick, while Chloe Arthur scored a 75th minute winner for the visiting Blues to move just two points behind Chelsea, who were in action in the Champions League semi final this weekend instead. The only other WSL action of the weekend took place on Saturday when Reading emerged victorious over Brighton after a single goal from Rachel Furness early in the second half. That result confirmed that Reading can finish no lower than sixth this season, while Brighton are now almost certain to end their campaign at top flight level in ninth place. ​​There will be a full WSL fixture list on Sunday 28 April, with Yeovil to host Chelsea on Tuesday 7 May, before the final day of the 2018/19 season on Saturday 11 May. Chelsea manager Maurizio Sarri has made the eyebrow-raising claim that reaching the Champions League final is ‘easier’ than getting to the same stage of the Carabao Cup. The Blues find themselves in a battle for the top four to qualify for next season’s premier European competition, while they also face Eintracht Frankfurt in the semi-finals of the Europa League next month. Speaking ahead of his side’s ​Premier League clash with Burnley on Monday night, Sarri seemed to play down the importance of the Champions League, comparing it unfavourably to Chelsea’s League Cup run. The Italian said (as quoted by the ​Daily Mirror): “The Premier League is very difficult. To get to the final of the League Cup, we had to play Liverpool, Tottenham and then Manchester City in the final. It is easier to get to the final of the Champions League. The ​Chelsea boss added: “People give the Champions League too much importance. Of course it is the most important competition for clubs, but now [in the knockout phase] it is one with straight elimination – the ball goes in off a post or out and you qualify or are eliminated.